This month on Brave Little State, we take a road trip of inquiry to answer your questions about intriguing Vermont road names. You know the feeling. You’re driving along, somewhere in Vermont, and you turn onto a road with an intriguing name. And you wonder where it came from. This happened to Richard Schwarz, of West Dover. Who or what, Richard wanted to know, was Kelley Stand? From whence came the name of this meandering dirt road? He’d heard a few theories, but he wasn’t sure, so he put his question to Brave Little State, VPR’s people-powered journalism podcast. Every month, Brave Little State answers questions about Vermont that come from you, our audience. The goal is to make our journalism more inclusive, more transparent and more fun. Have a question for us? Submit it here. | Fan of our show? Support VPR! Richard’s isn’t the only question about a road name that we take on in our episode this month. We have three other road names to consider, thanks to a handful of curious Vermonters. So buckle up. Our history guide as we answer these questions — our navigator, if you will, on this road trip of inquiry — is Paul Gillies. 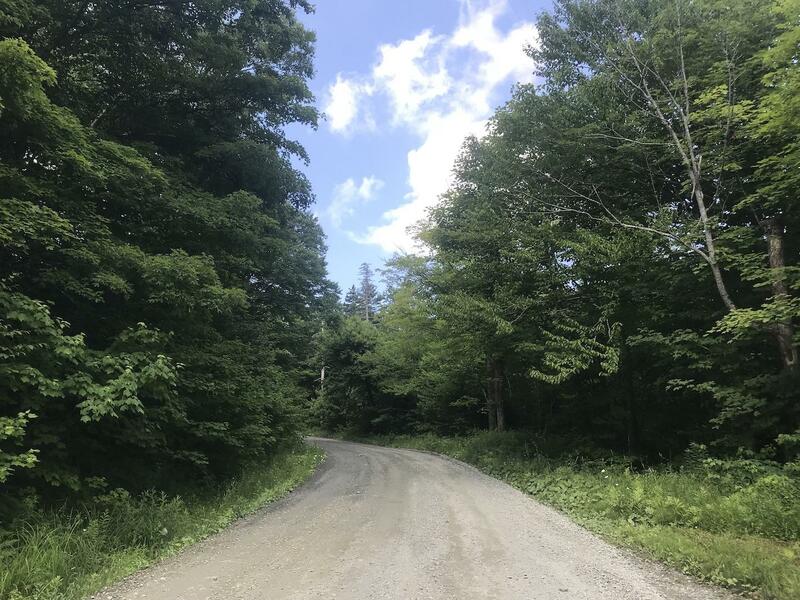 Paul writes and speaks about Vermont roads, especially old ones. He’s written a book called Uncommon Law, Ancient Roads, and Other Ruminations on Vermont Legal History. “I had to speak about old roads in Strafford a couple of Sundays ago, and I decided that I would take only turnpikes to get there from Berlin,” he explains. And then he calculates what all the tolls would have cost back in 1800. We asked Paul to take a whack at the some of questions we got about Vermont road names. Just so you can picture it, States Prison Hollow is really the only road connecting the Addison County towns of Starksboro and Monkton. It skirts around the base of a ridgeline that runs north to south, and cuts the towns off from one another. It’s a beautiful road, winding through farm fields and forest. To answer this question from Duane, Paul Gillies has a go-to source: a book called Vermont Place Names, by Esther Munroe Swift. Wait, what? That’s the answer to Duane’s question? But it turns out that if you ask the locals, neither of those answers is correct. “Throughout my childhood, my grandparents lived over in Starksboro village. And every Sunday afternoon we spent over at Grampa and Gramma’s,” says Priscilla Pierce, who grew up on the Monkton side. Most people seem to agree with Priscilla that that’s how the road got its name: not because of some unruly residents, or difficult farming conditions. But because, in wintertime, once you got into the hollow, you might not be able to get out. Cars would slide backwards. The school bus couldn’t get through. Being in the hollow in winter was like being stuck in a prison. But here’s the ironic part: not only is there no prison on States Prison Hollow Road, there’s also no hollow. At least today. It used to go through the hollow that gave it its name — but about 40 years ago, the route got changed. “I remember well when they did it, but I can’t remember exactly the time,” says Olive Phillips, who has lived on States Prison Hollow Road her whole life. People kept telling us we should talk to Olive, that she’s the one who knows everything — “And I keep telling you I don’t!” Olive insists. OK, so maybe she doesn’t remember everything, but Olive says that when she was a young adult — this would have been sometime in the mid-1970s — a road crew came in to straighten out the road. At night, after work, Olive would walk down from her house to see the progress they were making. “At the top of the hill there was a 90-degree curve. They took some of my father’s meadow and made that a little friendlier, so that it’s more gradual. And then what they did was they made the road go behind the actual hollow now,” Olive says. So is it a better road now? Since you don’t have to go down into the hollow anymore, there are no more worries about getting stuck in winter. So most drivers are probably grateful. But the road name remains. We wanted to try to figure out one more thing: How long has this name been around? We visited Candace Polzella, who’s a member of the Monkton Historical Society. At her farmhouse in town, she lay a couple of old maps on her kitchen table. So, no help there! A definitive answer remains elusive. But we did get a sense that even though the road is easier to drive on now, there are other reasons it’s still a little bit of a headache to have States Prison Hollow as your address. And when people find out where Olive lives, they’re curious about the road name — so this is something she’s been explaining her whole life. Full disclosure: Katie and Rich are two friends of Brave Little State host Angela Evancie. And they live on the Poor Farm Road in Thetford Center. There are seven others around the state, and 24 Town Farm Roads. And unlike States Prison Hollow Road, there is a very clear and definitive etymology here. Though it isn’t a very happy one. “Vermont towns, at first, were responsible for the poor. There wasn't a state welfare office or a state aid office,” explains our road expert Paul Gillies. This aid took many forms, one of which was the establishment of a town farm, “for various purposes not just for the poor but for the disabled and sometimes used as a house of correction for local affairs,” says Paul. These were the poor farms, or the town farms, that got roads named after them. You might end up on a poor farm if your own farm went under. But the farms also took in disabled people, like Paul said, and elderly people. And you were expected to farm. Paul says this is because towns didn’t ultimately want poor people in their communities. As federal and state welfare programs came around in the 20th century, the use of poor farms began to fade. And in 1967, the law that led to these farms was struck from Vermont’s books. Today, you might drive a Poor Farm Road or a Town Farm Road and see little trace of the history there. But in South Woodstock, the former poor farm is still very visible from Route 106. The former poor farm, on Town Farm Road, is still very visible from route 106 in South Woodstock. “It’s a very special place. 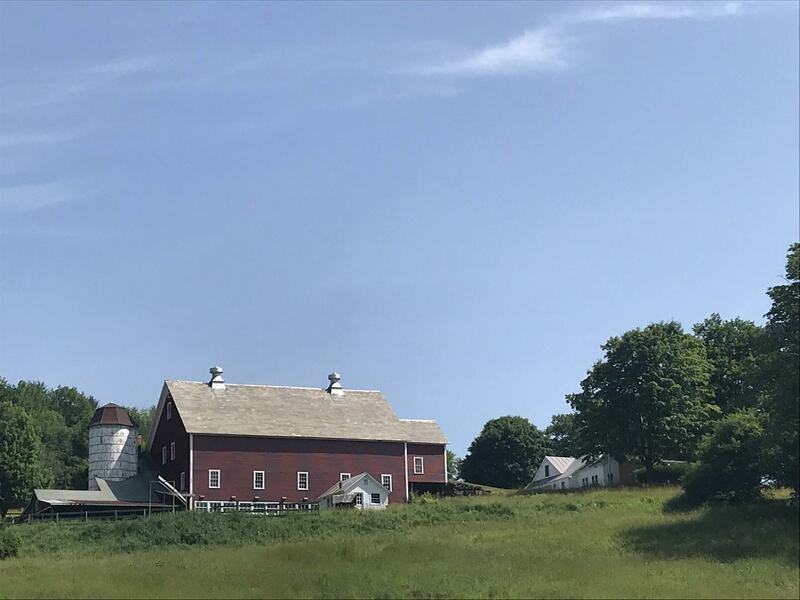 It stands up on a hill, and big red barn, and we’re very proud of the hillside,” says Nancy Lewis, who lives on the property. Nancy’s parents-in-law bought the farm in the 1940s. They were only the second owners after the farm’s era as a poor farm, which lasted for about 100 years. The property has been in the Lewis family ever since, and Nancy says the farm is sometimes still referred to as the town poor farm. Instead of raising sheep or cows here, as had been done on the poor farm, the Lewis family kept horses, for pleasure riding. They had some paid employees, but their kids did a lot of work too. “Our children were our employees,” Nancy jokes. 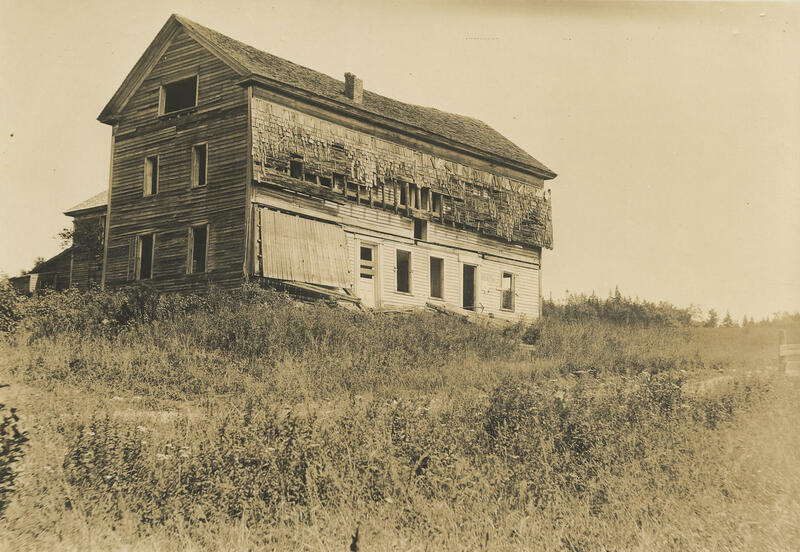 With the exception of some peripheral additions and demolitions, the main barn and farmhouse are unchanged from the roughly 100 years that this property was the town's poor farm. A few years ago, Bob Holt, now a retired surveyor, did a project with a group of of fourth-graders, researching the history of this farm. “Town reports, at least from 1869, give an inventory of everything that was on the farm — how many cows, and how many sheep, there were even a couple pigs,” he says. People here also worked the town forest nearby, harvesting firewood and sugaring. We walk down from Nancy’s house, which is newer, to the original farmhouse and the big post and beam barn. Our guide is Darwin Lewis, Nancy’s son. "If you look down over here you can see the troughs, and this was all sheep, where they would have them in stanchions there," he says. The top two stories of the barn are mostly empty, with scattered debris from times past. The ground floor is where the Lewis family kept their horses; there are box stalls built from red oak. “My parents put [it in] in the late ‘70s,” Darwin says. The horse stalls have iron bars up top, and they sort of look like prison cells. When Bob Holt brought the fourth-graders here, they got all excited because they thought this is where workers on the poor farm got locked up when they misbehaved. 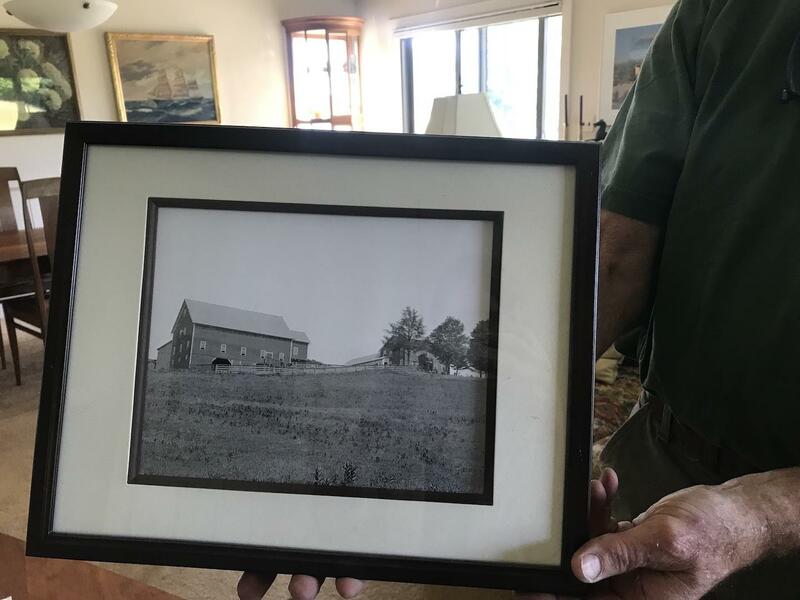 Of course it wasn’t, but Bob says records show there were cells for punishing workers on this farm — in the boarding structure that used to be attached to the farmhouse. “[When] they refused to eat certain things that were provided, they were put in the cells with just bread and water, ‘for a period not to exceed two days,’” Bob says. It’s the kind of thing that captures the imagination of elementary school students — but Bob says this chapter in Vermont’s history is also a sensitive one for families in town. And the Town Farm Roads and Poor Farm Roads all over the state are a reminder of that history. Limestone would be cooked in those kilns at very high temperatures. 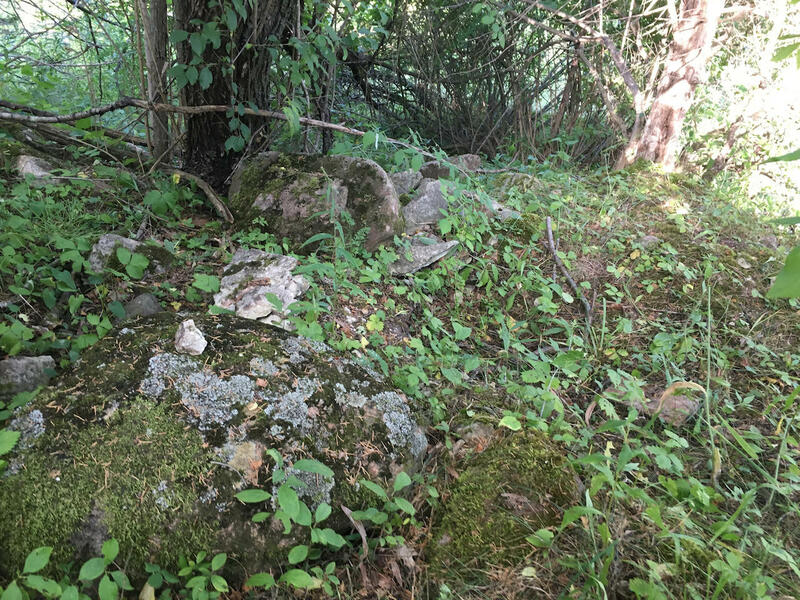 What’s useful about limestone is that when you cook it for enough time, it becomes quicklime, which is a powder you can use for mortar or fertilizer — both useful things in Vermont’s early agrarian days. There are six Lime Kiln Roads in the state that go through multiple towns. Now, theoretically each one of those roads has a kiln near it. But as the old journalism saying goes, if your mother says she loves you, check it out. So in this case, if the road is called Lime Kiln Road, we gotta find a kiln. Our guide on this expedition is Brennan Gauthier, an archaeologist with the Vermont Agency of Transportation. And, as of today, a lime kiln detective. “Yeah, that's me, that’ll go on my LinkedIn page,” Brennan says with a laugh. We’re parked on the side of Lime Kiln Road in Charlotte. Brennan knows that somewhere nearby, there’s still an existing kiln. We head into an overgrown field full of tall, prickly plants. Brennan points over to a mound surrounded by brush and trees. That’s the kiln hiding in there. Brennan scrambles up to the top, ducking branches. It’s so overgrown that if you didn’t know what you were looking at, you’d think it was just hill that happened to have a few rocks on it. A mound of rocks and brush is all that's left of the lime kiln that gave the road in Charlotte its name. We kneel down and Brennan points to divot in the ground. Brennan looks around for more artifacts near the old kiln, and excitedly pulls half a brick out of the ground. “This is called a firebrick, and they were bricks that were fired with a different material," he says. "It allowed them to resist heat, so you line the lime kiln with this." Brennan even manages to dig up a few pieces of lime at the site, and crushes the stones into a chalky white powder. “This is lime that's probably from the last burning this thing ever saw. This is what you'd see in the end, basically. This is the powdered lime,” Brennan says. What Brennan’s holding in his hand is why people built lime kilns — to burn the limestone into a powder. Cooked limestone turns to quicklime, which is a powder you can use for mortar or fertilizer -- both useful things in Vermont's early agrarian days. 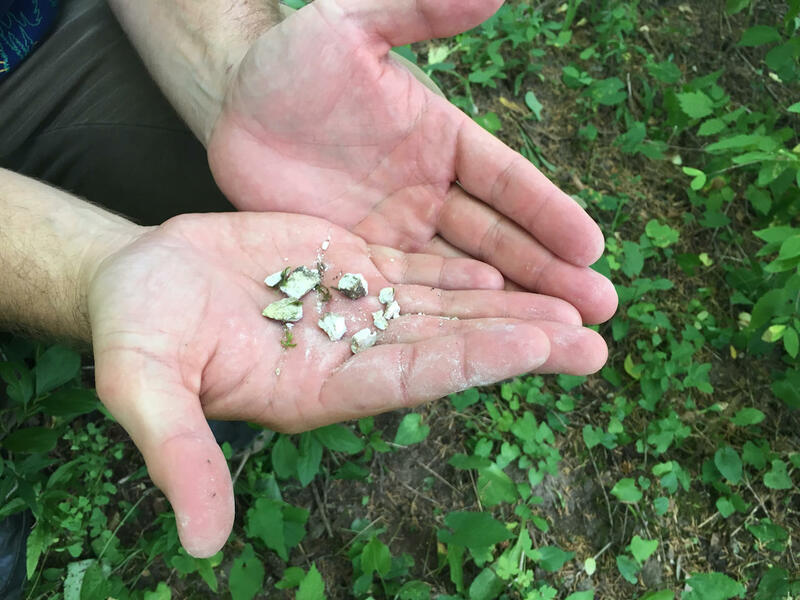 To understand why there’s even limestone to burn, we’re going to take a brief geological detour with Laurie Grigg, an assistant professor of earth and environmental sciences at Norwich University. She says many, many years ago there was an ocean in Vermont. And this is important because limestone is formed from seashells. “Shells — whether they be big coral shells or clamshells or little tiny microscopic foraminifera or plankton ... When organisms die, [they] accumulate on the bottom of the sea floor,” she says. “Through time [they] get buried and compressed and turned into rock called limestone." And the kind of limestone we have a lot of in Vermont is marble. “That happens under high heat and pressure, and usually in Vermont it happened during a series of mountain-building events that formed the Green Mountains in the Appalachian Mountains,” says Laurie. So we have bands of marble – which is limestone – throughout Vermont. That’s what people would cook in the kilns to make quicklime. There used to be lot of lime kilns around the state, possibly as many as 160, according to the essential book on Vermont’s lime industry. It’s called 200 Years of Soot and Sweat: The History and Archeology of Vermont’s Iron, Charcoal, and Lime Industries. In the book, author Victor Rolando writes that the earliest lime kilns in the state were built by the French in the 1600s at Isle La Motte. But it wasn’t until the early and mid-19th century that lime kilns really took off. The kiln that we’re exploring with Brennan is probably from around that time period: the mid to late 19th century. And it’s near a farm. In fact, Brennan says he'd looked at some survey images and spotted a limestone quarry for the kiln nearby. “So maybe we could just walk over there and see what we see,” Brennan says. It’s not far – maybe a minute’s walk across the overgrown field on the side of a hill. We look up and see rocks protrude from the ground among the trees. This is where people who used the old kiln would have gotten their limestone. Not far from the former Charlotte lime kiln is an abandoned quarry, which supplied the lime for cooking. So, just off the side of this dirt road in Charlotte, there are traces of a lime kiln and a quarry. We poke around the quarry a little more and then head back through the field, over the fence and back to his car. All in all, a pretty successful trip – and now we can say we know at least one Lime Kiln Road really has a kiln. In keeping with our theme of “roads named for things that used to be on them,” we return to the question of Kelley Stand Road, which we got from Richard Schwarz. Kelley Stand Road meanders along the Roaring Branch river from Stratton to Arlington, climbing over shoulder of Stratton Mountain. This is our last question of the episode — and in some ways, the answer is the most surprising. We drive part of the road with Bill Budde. Kelley Stand runs east-west, from Stratton, up over the the shoulder of Stratton Mountain, and back down again to Arlington. That’s where Bill Budde works: He’s the curator of the Russell Vermontiana Collection at the Martha Canfield Library in Arlington. We’re heading up the curvy dirt road, with the Roaring Branch river tumbling over boulders nearby, and thick forest on both sides. Like much of Vermont, it hasn’t always looked like this. “Looking at this now, there’s so many trees, but it’s actually a very young forest,” Bill says. Young because the old growth was logged. Bill says there were two big logging camps here, and 18 mills on the Roaring Branch that made things like washboards and shoe pegs. Kelley Stand Road used to be home to large logging camps and 18 mills. 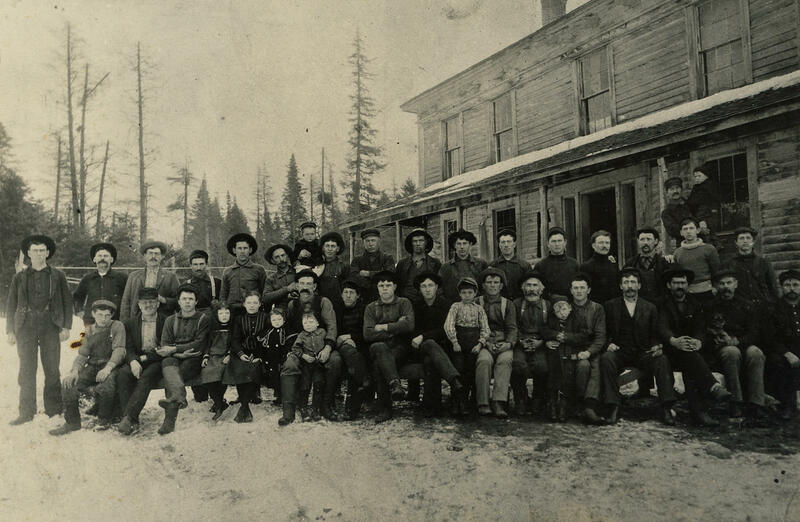 Here, the men of an area known as "Hell's Half Acre" gather in front of a boarding house. But the "stand' in Kelley Stand has nothing to do with trees! “There are reports and stories that the mountains around Arlington had been pretty much denuded of all the trees by 1800,” he says. You might be thinking what we thought: Kelley Stand, stand of trees. This road was probably named after a logging operation, right? Wrong. “The hotel actually started off probably around 1840, when a fellow named Russell Lawrence leased the name to William Kelley," Bill says. The Kelley Stand was a mountain hotel, run by this guy William Kelley. Stand is antique slang for a place to stay. “And that’s pretty confusing for a lot of people,” Bill says. The stand, or hotel, had 15 rooms, and a ballroom on the third floor. Bill says it was popular among both locals and travelers. The Kelley Stand hotel, circa 1885. There were 15 rooms on the second floor, and a ballroom on the third floor. 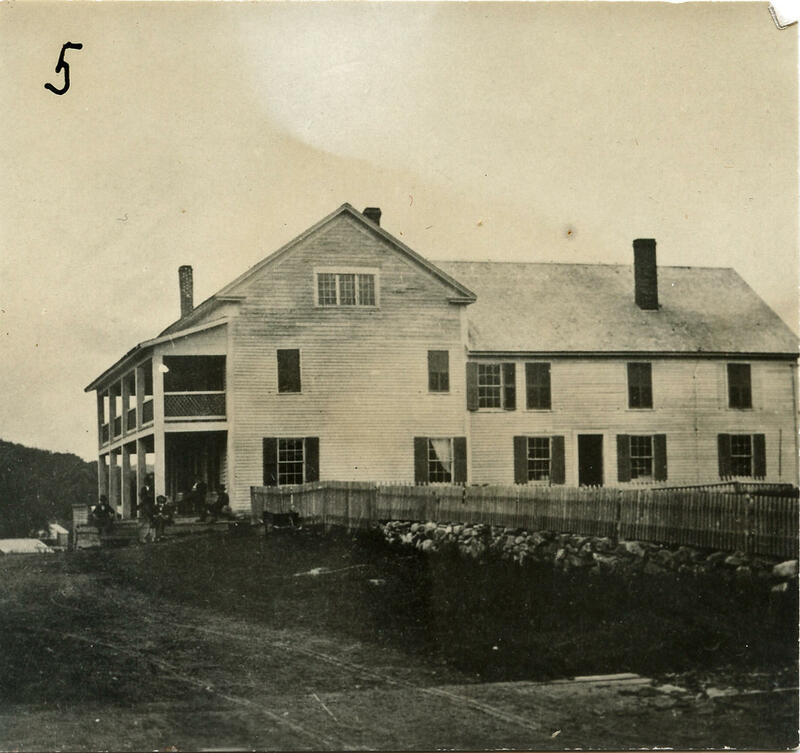 With its trout dinners and balls, the mountain inn was a popular destination for both locals and travelers. Of course this was before cars, so people traveled to the Kelley Stand by horse. “Two dollars and fifty cents would get you a meal, a room, and care for your horse and team,” Bill says. Even today, Kelley Stand Road isn’t plowed in the winter. But imagine trying to climb up the snowy mountain in a horse-drawn carriage. Another fun fact: Before it was Kelley Stand Road, it was the Stratton Turnpike — one of those roads that charged a toll, that we heard about from Paul Gillies. At this point we’re pulled over by the Sunderland/Stratton town line. Bill takes out some historical documents from a book called Voices of Sunderland by Shirley Lawrence Letiecq. By the 1930s, the grand hotel had fallen into disrepair. According to Bill Budde, the structure was bulldozed in the 1950s. The Kelley Stand changed hands a few times, and eventually closed down. Bill says the structure was bulldozed around 1950. He says if you know what to look for, you can still find the side road that led to the hotel, but even he can’t spot it today. Things are more overgrown since the last time he was up here, 10 years ago. “It has a sense of history, I mean this is ... it’s going back to nature in a way that is, I think, rather sentimental in my feeling about it,” Bill says. Bill reads a poem by Walter Hard, a Manchester poet. It was written in 1936, when the Kelley Stand Hotel was well past its prime. And just like Bill Budde, the poet embraced the passage of time. The isolation of mountain farms. But the old tavern is holding fast to the gay days. And the staircase is broken and shaky. With its arched ceiling clean and white. Are only the wrinkles of old age. When dancing feet made merry. Special thanks to Paul Carnahan, Brennan Gauthier, Devin Colman and Michelle Fields. Brave Little State is a production of Vermont Public Radio. We have support from the VPR Innovation Fund, and from VPR sustaining members. If you like this show, consider becoming one. This month’s question led Brave Little State straight into an unfolding story — about an outsider with deep pockets and big ideas, and the towns that banded together to reject those ideas. Those 'Aging Hippies' Who Moved To Vermont ... Where Are They Now? For the free-thinkers and radicals who moved to Vermont in the 1960s and 1970s, the past may be obscured in a cloud of … wood … smoke. But what does the present look like? Is Vermont Really Losing Young People? Since we started this show, there’s a question we’ve gotten a lot: Why are so many young people leaving the state? This month on Brave Little State, we’re doing things a little differently. Instead of taking on one of your questions about Vermont, we’re taking on three - in a kind of local history lightning round.